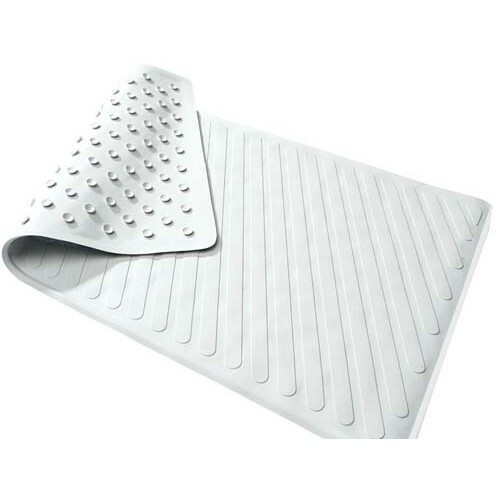 Bath Mat, Non Slip Shower Mat, BUY Shower Safety Mat, B21600. Slip-Resistant Bath Mats, manufactured by Carex, provide a padded non-slip surface while showering or bathing. With hundreds of suction cups, the bath mat securely adheres to the shape of the shower or bath. 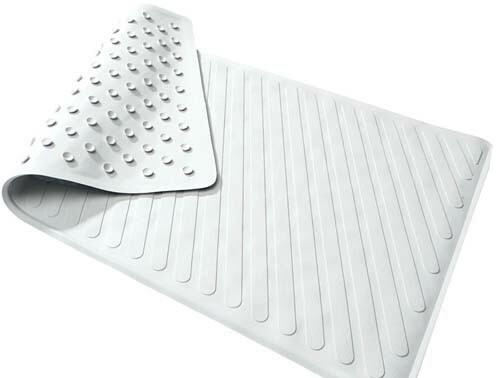 Reduce the danger of shower falls or accidents with this shower safety padded mat. The non-slip surface not only makes showering safer, it is also more gentle on the body and joints compared to the rigid, hard surfaces of standard baths and showers. How often to you have to remove the rug to clean under it??? Regular weekly maintenance can be performed in order to clean underneath the rug area. The one side will not lay flat no matter what I try. Rolls up all the time which is even more dangerous for me. Think it could work IF it would lay flat!